So, I'll admit that most of my weekend was, or will be, spent hanging around the house, doing the normal boring necessities. 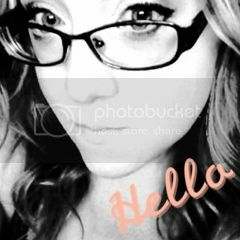 However, I did get a chance to go to the movies this weekend, and I had a blast! I don't know why, but I've always loved doomsday movies. (Creepy much?) 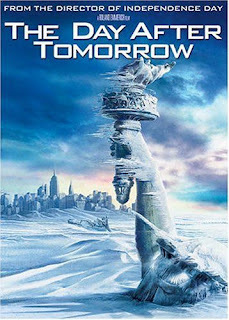 I think that The Day After Tomorrow is one of my all-time favorites... at least in the doomsday genre. 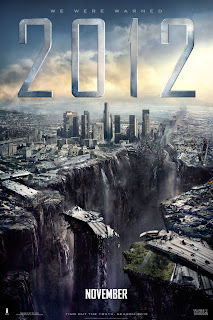 So, this weekend, my husband and I, along with my husband's MAN HUSBAND and his wife (yes, my husband has a MAN HUSBAND, or best friend, but it's more fun to call him his MAN HUSBAND), went to go see 2012. At first, after hearing some bad reviews on the movie, I was a little skeptical about actually wasting $10 on a ticket to see this movie, but I took a chance and I'm glad that I did. This movie far exceeded my expectations. Synopsis - Never before has a date in history been so significant to so many cultures, so many religions, scientists, and governments. A global cataclysm brings an end to the world and tells the heroic struggle of the survivors. Okay, so the synopsis doesn't give away too much, and I don't want to spoil it for you either. However, I will tell you that this movie was great! And if you like action packed movies with awesome visual effects, well, this is the movie for you. This movie reminded me a lot of The Day After Tomorrow, and maybe that's why I loved it so much. One major difference between the two movies is reason for why the world is ending. In The Day After Tomorrow, there's like this massive, global, weather front that freezes most of the world, sending us back into a literal Ice Age. However, in 2012, there will be no freezing. Actually, it's the exact opposite. In 2012 a group of scientists find that the sun is warming the earth so much that it's actually melting the Earth's core (scary stuff). I won't give away anymore, but if you love doomsday movies, you should check this one out. It's definitely worth the $10 just to see it on the big screen. Seeing that movie was about the extent of my fun filled weekend. So, while waiting in a forever long line, I flipped through the pages of the magazine showing my husband all the pretty pictures (as if he cared) secretly wishing that one day I would get to wear clothes that cool. And, of course, I had to show my husband (because of the cool clothes, of course. Haha... that's funny... I didn't even buy that one! But this picture just happens to be my favorite from the shoot because it reminds me so much of a scene in the Twilight movie). The dress $1,535, the skirt $10,300, the shoes $795. Laying so close to Edward (or Robert Pattinson) ... PRICELESS!!! I laughed so hard, I nearly cried. His comment... so true! Well, enough rambling for today. Hope everyone has a GREAT Sunday. I've procrastinated enough. Now I'm off to write. Oh, what the heck, I've wasted this much time...just a couple of more pictures for the road. You know, I think he looks very mysterious and thus alluring, but in all the previews of New Moon where they show the scene where he takes his shirt off, I'm like, "Meh, I've seen better." Yeah, I'm with you on that. Rob just has the mysterious appeal. However, I think the main reason he is so appealing is because he is the tangible embodiment of Edward, which instantly makes him ten times sexier. Oh, and how can we forget... the accent. I'm a sucker for accents. Now, Taylor Lautner's shirtless scenes... all I can say is, "Whoa, baby!" I have to keep reminding myself he is just a child, but he is quite possibly the manliest looking child I've ever seen. Can't wait for New Moon!